Schedule meetings, create tasks, or get updates from your team right within Chat. 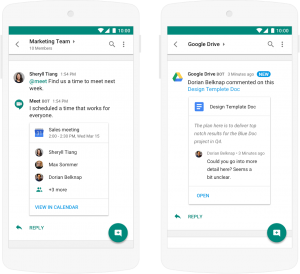 In addition to useful integrations with G Suite apps, Chat connects to several third-party tools, helping you manage all of your work in one place. Chat is built with leading enterprise-grade security including mobile device management, single-sign-on, two-factor authentication, admin settings, compliance, and Vault retention, holds, search & export.